Speaking to RT the Russian president stressed that Snowden revealed “nothing we didn’t know before”, adding that surveillance “is becoming a global phenomenon in the context of combating international terrorism”, and that “such methods are generally practicable”. “I can tell you that, at least in Russia, you cannot just go and tap into someone’s phone conversation without a warrant issued by court,” Putin said answering the question of RT’s Editor-in-Chief Margarita Simonyan. Commenting on Obama’s statement that “You can’t have 100 per cent security and 100 per cent privacy,” Putin disagreed, saying it is possible if done within the law. Earlier on Tuesday, Putin’s press-secretary Dmitry Peskov told to a newspaper that Russia could consider the possibility of granting political asylum to 29-year-old Edward Snowden, if such a request is made. The ex-CIA worker is behind one of the biggest leaks of our time as he disclosed the existence of PRISM, the National Security Agency’s (NSA) massive data-mining surveillance program, to The Guardian last week. The whereabouts of whistleblower remain unknown after he checked out of a Hong Kong hotel on Monday after revealing his identity and making a public statement in a interview with The Guardian a day earlier. Speaking about the conflict in Syria, the president said it was possible to avoid the civilian war by conducting reforms in due time. However, he added, one should take into account that the entire Middle East is currently finding itself in a state of uncertainty and conflict – and it’s wrong to try and interfere from outside. Putin pointed out that the West is supporting some certain organizations that are fighting Assad in Syria, and they are countering “those very same groups” in Mali. Putin reminded that the quality of life in Libya was one of the highest in the region before the regime change. “This is what happening both in the US and in Russia,” Putin said. “Russia doesn’t try to influence Occupy activists, yet foreign agents try to do this in Russia,” he said, referring to the Occupy movement that initially started from protests in New York and then spread worldwide. Iran should be entitled to pursue a non-military nuclear program, as long as it keeps in line with international law, the Russian President said. 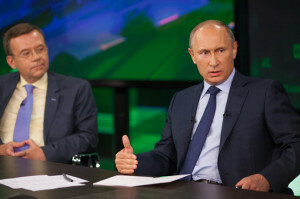 Putin stressed he does not doubt that Iran is abiding by the treaty on nuclear arms non-proliferation. “You don’t see proof of the contrary,” he said, also citing the recent IAEA report supporting his point. That said, Iran should also take into account the concerns of the other countries in the region, as well as those of the international community, and refrain from threatening rhetoric, Putin believes. Russia is willing to further cooperate with Iran, as long as it acts within the international mandates, the President said. Speaking about mass demonstrations, the President said that “any opposition is good, right and helpful” if it acts within the law. “This is what’s happening both in the US and in Russia,” Putin said. “Though when we do that we are criticized, but when [United] States does, it is a norm. These are the so-called double standards,” he added. The use of drones is impossible to stop as combat tools are constantly improving, but their use should be controlled, the Russian President said. “I doubt that it is possible to ban them all. But to place them under control, under certain laws is indeed possible, and necessary,” he said. It is, however, necessary to continue fighting terrorism, the President stressed. The Russian president was visiting RT’s new Moscow broadcasting center, which opened last December. The 28,000 sq. m purpose-built facility is one of the biggest and best-equipped in the world.